This article provides in-depth fundamental analysis of Dynemic Products Ltd, an Indian manufacturer of food colours, dye intermediates being used in industries like food, cosmetics, pharmaceutical etc. I have analysed the company Dynemic Products and would request for your opinion and inputs on the same. The analysis is presented below. The sales of the company have grown over the last 10 years at 17%. The OP and NP have grown at 14% & 25% respectively in 10 years. Over the years the company has maintained OPM in the range of 9 % to 17% and NPM in the range of 4% to 9%. Thus exhibiting that it has some power to pass on the increase in input costs to customers and not in a commodity business where input cost increases cannot be passed on, however the wide fluctuation also shows that there is lag in passing on the increase in input cost increases and the company is not in a strong bargaining position with its customers. The SSGR of the company has been increasing from 5% to 17% and it has actually grown at 17%. The FCF % of the company is 25 %. The company has a manageable debt at 25 CR which is declining in the last 2 years and D/E at 0.3 and below 1 for 10 years and Interest coverage at 7.2. As, in the interim, the company was growing at a rate higher than SSGR thus Debt had increased however for the last two years the SSGR has increased and the company has reduced debt as well. The company is available at P/E of 10.5 which provide Margin of Safety and the 10 Year G Sec is at 6.7%, equivalent P/E of 14.9. The SSGR is also at 17% and the company growing at 17%. The FCF % is 25%.On top of this company has low debt. The company appears to have competitive strength as NPM and OPM being maintained at decent levels although fluctuating. The margins have further increased over the years from 9% to 17% for OPM and 5% to 9% for NPM. The company is into Food and Lake Colours. Could not get hold of any identifiable peers, would appreciate if you can let me know of any direct peers. They export around 65% of their sales to developed markets NA and Europe. Crisil has rated the company has assigned the company BBB due to moderate size of the operation and competitive intensity, however, did not mention any competitors. The conservative financed capital structure and good debt metrics were mentioned as strengths. 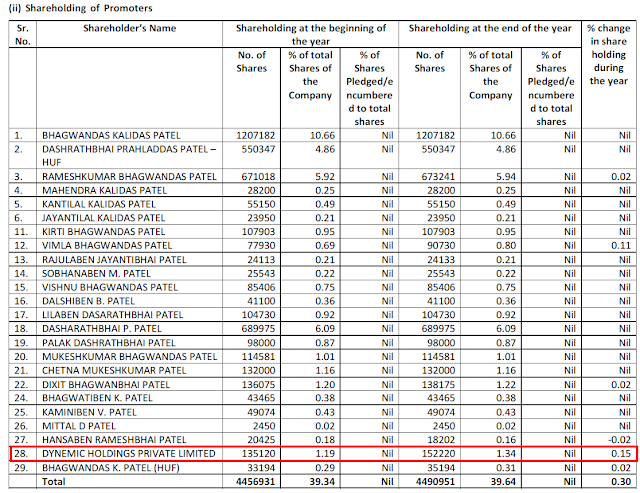 Promoter shareholding is low @39%. However, they have bought some shares in the 1st week of October as reported by BSE, which should increase the holding to over 40%, still low and lower than 51%. 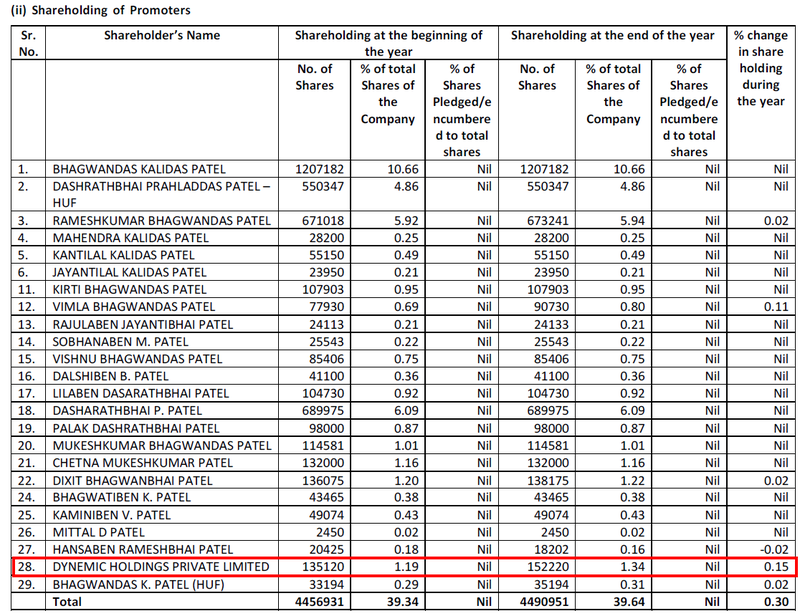 There are no shares pledged by the promoters. The management has not been able to complete projects in the past, expansion was delayed in the year 2007 and 2008 and even now their expansion in Dahej appears to be delayed for the last 4 years as it being mentioned in the Annual Reports for the last 3 to 4 years that they would be expanding in Dahej. However, the plant is yet to be operational. Google search did not throw up any controversy or issues with the management. The Salary drawn in absolute amount is increasing irrespective of the performance of the company. However, salaries are not at high levels and they are fluctuating as a % of NP due to the performance of the company. The related party transactions are of Fixed Deposits and investments settled during the year and purchase of goods and conversion charge which was 8,8 Lakhs and 5.6 Lakhs. The related party transactions do seem to transfer economic benefits from the minority shareholders to the promoters however the amounts are not significant. The company has been paying dividends regularly except one year, 2015 in the last 10 years. The company has not issued any warrants to the promoters and there has been no equity dilution over the last 10 years. Thanks for sharing the analysis of Dynemic Products Ltd with us! We appreciate the time & effort put in by you in the analysis. 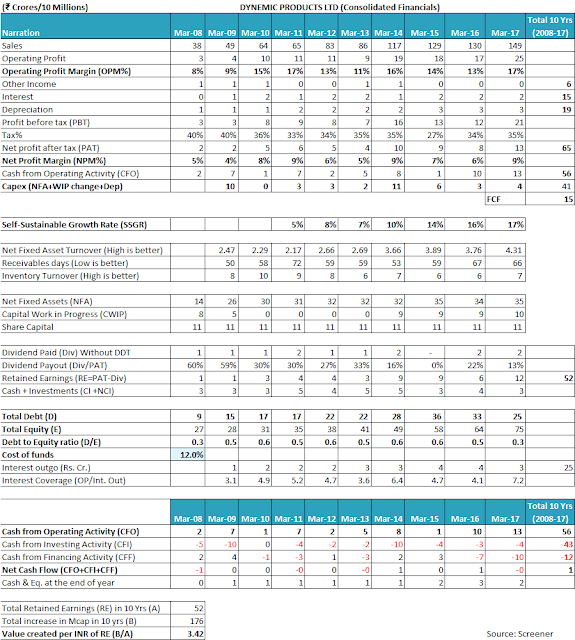 Let us first try to analyse the financial performance of Dynemic Products Ltd over last 10 years. We believe that while analysing any company, an investor should always look at the company as a whole and focus on financials which represent the business picture of the entire group including operations and assets. Dynemic Products Ltd has a subsidiary, Dynamic Overseas (India) Pvt. Ltd. (98.09% ownership) and an associate entity Dynemic Holdings Private Ltd (49.22% ownership). Therefore, while analysing Dynemic Products Ltd, we have analysed the consolidated financials of the company for FY2008-17. Dynemic Products Ltd has been growing its sales since last 10 years (FY2008-17) at a rate of about 10-12% year on year from ₹38 cr. in FY2008 to ₹149 cr. in FY2017. The sales growth achieved by Dynemic Products Ltd has been associated with fluctuating operating profit margins (OPM). OPM increased from 8% in FY2008 to 17% in FY2011 and then declined to 11% in FY2013, increased to 16% in FY2014 only to decline again to 13% in FY2016. OPM in FY2017 stands at 17%. These fluctuations in the operating profit margin indicate that Dynemic Products Ltd has low pricing power over its customers and as a result, it is not able to pass on the changes in the raw material costs to its end customers on a timely basis. The net profit margin (NPM) of Dynemic Products Ltd has been broadly following the trend of the operating profit margin (OPM) and thereby, NPM has been fluctuating within the range of 4%-9% over the years. The tax payout ratio of Dynemic Products Ltd, over the years, had been around the standard corporate tax rate prevalent in India. While assessing the net fixed asset turnover (NFAT) for Dynemic Products Ltd, an investor would notice that the NFAT of the company has been improving over the years and has increased from 2.17 in FY2011 to 4.31 in FY2017. NFAT has declined during FY2009-FY2011 when it reduced from 2.47 to 2.17. However, this period coincides with the time when the company undertook a major expansion of its manufacturing capacity. As per 2009 annual report of the company, page 6, it increased its manufacturing capacity to nearly 3 times its existing capacity i.e. from 1,980 MTPA to 5,700 MTPA. The decline in the NFAT in the period immediately after a large capacity addition is operationalized is expected because it takes time before the company is able to source new orders and run the new capacity to its optimal levels and during this intervening period of sub-optimal utilization of newly created assets, the NFAT witnesses a decline. However, if the management is able to source additional orders in the following years to increase the utilization of the new capacity, then the investors would notice that the NFAT shows signs of recovery like it has in the case of Dynemic Products Ltd. As a result, the NFAT witnessed improvement from the levels of 2.17 in years subsequent to FY2011. Increasing NFAT over the years (from 2.17 in FY2011 to 4.31 in FY2017) also reflects that the management is able to use its existing asset more efficiently and is able to generate higher revenue using the same amount of functional assets. An investor would note that the last additional capacity creation was operationalized by the company in 2009 and post that it has not added any new capacity whereas the revenues are consistently growing. In the absence of disclosure of capacity utilization level data by the company in its communications to shareholders, an investor may expect that over last 8 years (2009-17), the company might have already reached/about to reach the maximum capacity utilization level. It is advised that an investor should try to get clarity about the current capacity utilization levels of the company and closely monitor the developments related to the approvals for the new unit at Dahej. This is because if the current capacity is nearing full utilization and if there are continuous delays in getting approvals for the new unit, then the company might face challenges in sustaining the sales growth due to capacity constraints. The company may also lose customers in this competitive world if it is not able to meet their additional quantity requirements as and when these are needed. An investor would also notice that company has a high NFAT over the years, which has exceeded 4 in FY2017. Such NFAT levels are very good asset turnover for most of the businesses. Such levels of NFAT are usually seen in companies, which do not need to invest a lot in their plant and machinery or those who rely on outsourcing of the manufacturing process and in turn primarily act as trading companies. The companies, which are not into trading of goods and enjoy such high fixed assets turnover on account of low capital intensiveness of their operations face a lot of competition unless their market is protected by intangible factors like brands or patents. In a high asset turnover business, a lot of people are able to establish manufacturing capacity even by raising a Ltd amount of funds due to low capital intensiveness and thereby pose competition to established players. Therefore, it should not come as a surprise to an investor that Dynemic Products Ltd faced a lot of pricing pressure on its products due to high competitive intensity. Looking at the inventory turnover ratio (ITR) of Dynemic Products Ltd, an investor would notice that ITR of the company had been fluctuating between 10 to 6 over the years. Such fluctuating inventory level indicates that the company is not able to plan its inventory levels well, which is usually seen in conditions when the majority of the sales of the companies are on spot basis and are not backed by long-term supply contracts, which is another feature of highly competitive industries. When an investor analyses the receivables days of Dynemic Products Ltd, then the investor would notice that the receivables days of the company have been witnessing significant fluctuations over the years. During FY2008-11, receivables days deteriorated from 50 days to 72 days. However, this deterioration seems to be associated with the economic slowdown of FY2008-11, in which most of the customers might have been impacted and as a result, the customers might have started making delays in payments. Subsequent improvement of receivables days from 72 days in FY2011 to 53 days in FY2014 despite near doubling of sales revenue from ₹65 cr to ₹117 cr. during the same period indicates efficient collection practices of the management. However, an investor would notice that in the recent year receivables days of the company have again started deteriorating and have increased to 66 days in FY2017. It is advised that an investor should monitor the receivables days of the company closely to monitor whether additional money is getting stuck in working capital of the company. It seems that primarily due to the fluctuations and deterioration in inventory and receivables position, Dynemic Products Ltd has not been able to convert reported a profit after tax (PAT) into cash flow from operations (CFO). As a result, the company has reported a cumulative cash flow from operations (cCFO) of ₹56 cr over last 10 years (FY2008-17) against cumulative net profit after tax (cPAT) of ₹65 cr. The investor would notice that Dynemic Products Ltd has witnessed an SSGR ranging from 15-17% over the years. An investor would appreciate that the SSGR of Dynemic Products Ltd is about 15-17% whereas it has been growing at a rate about 10-12% over the years. As a result, the investor would appreciate that the company has been able to fund its growth while keeping the debt levels under check. The company has been able to increase its sales from ₹38 cr. in FY2008 to ₹149 cr. in FY2017 by doing a capex of ₹41 cr. while its debt levels decreased by ₹16 cr. from ₹9 cr. in FY2008 to ₹25 cr. in FY2017 and debt to equity ratio is under check at 0.3. If an investor analyses the total cumulative financial performance of Dynemic Products Ltd over last 10 years (FY2008-17), then she would notice that the company had met the entire capex of ₹41 cr. from its cumulative CFO of ₹56 cr. during the same period. As a result, after meeting entire capex, Dynemic Products Ltd had a free cash flow (FCF) of ₹15 cr. An investor would notice that the company has been able to report a free cash flow after meeting all the capital expenditure requirements despite its profits getting stuck in working capital over the years. This is essentially the result of low capital intensiveness of the manufacturing operations of the company as discussed above. The fact of low capital requirement needed to create additional capacities as reflected by high NFAT, ensure that the company can sufficiently meet its capex requirements despite cash generation being on the lower levels and thereby still report an FCF. Dynemic Products Ltd seems to have used the FCF (₹15 cr.) along with the non-operating income of ₹6 cr. (Total ₹21 cr. = 15+6) to meet the interest expense (₹15 cr. ), partly pay dividends (₹13 cr.). The company seems to have met the cash flow gap by raising additional debt of ₹16 cr. over the years and has about ₹3 cr. available with it as cash & investments. It seems that the markets have also appreciated that Dynemic Products Ltd has been able to keep a strong cash flow position along the growth path and as a result, its market capitalization has increased by about ₹2,590 cr. over last 10 years against the retained earnings of about ₹342 cr. over last 10 years. It amounts to the creation of a wealth of about ₹7.5 for each ₹1 of earnings retained by the company. An investor would notice that out of the four members of the Patel family on the board of the company in the executive positions, three of them, Mr. Bhagwandas Patel (aged about 63 years), Mr. Dashrathbhai Patel (aged about 66 years) and Mr. Rameshbhai Patel (aged about 54 years) seem to be from the first generations of the promoters in the company. The presence of Mr. Dixit Patel (age 37 years) as a part of the board of the company provide sufficient time for learning and grooming to take the company ahead. While observing the stock exchange announcements done by the company in the recent months, then an investor would note that the company has made a lot of disclosure about the promoters picking up additional stake in the company. On the face of it, it seems a positive sign that the promoters are displaying faith in the business prospects of the company. 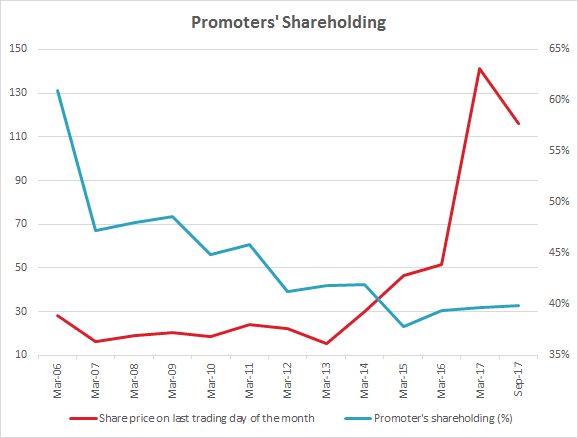 However, an analysis of the trend of promoters’ shareholding in the company since March 31, 2006 (the earliest date for which the shareholding pattern data is available on BSE website), indicates that over the years, the stake of promoters’ in the company has declined significantly. An investor would notice that that from March 2006 to Sept 2017, the stake of promoters has declined from more than 60% to current levels of about 40%, which is a significant reduction in stake including breaching the key level of 50%. We believe that the investors should analyse the shareholding levels further including the change in promoters’ stake, other large public shareholders to assess whether the shareholding of the company is shifting into the hands of friendly entities/persons. Otherwise, there might be an increased risk of the company getting into the position of exposing itself to takeover battles. 3) Investment in the associate company, Dynemic Holdings Pvt. Ltd. The status of DHPL being an associate company/shareholding of less than 50% (49.22%) means that Dynemic Products Ltd is not in the management control of DHPL. 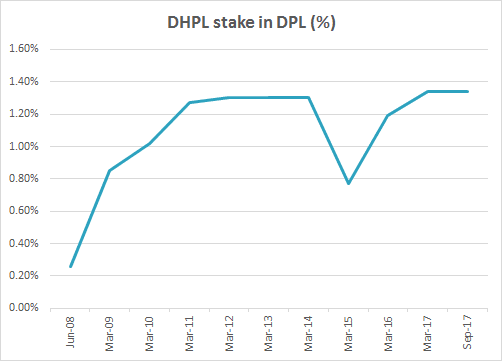 Instead, the party owning balance 50.78% stake in DHPL is in the management control. 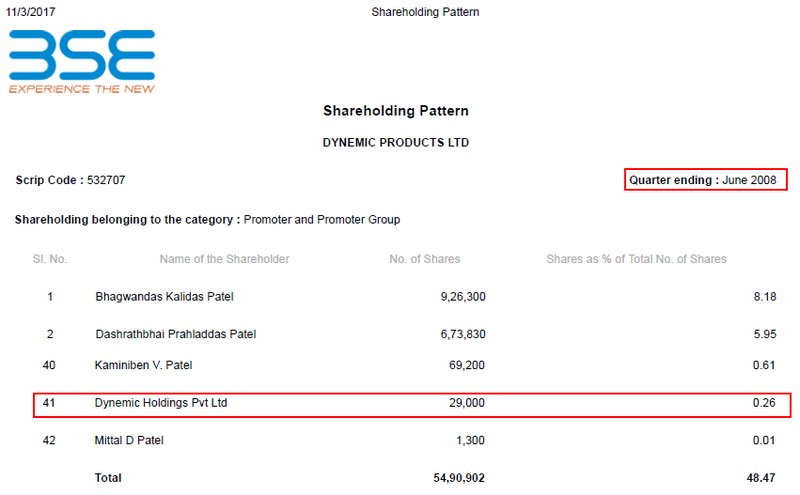 The presence of DHPL in the list of entities through which promoters own stake in Dynemic Products Ltd can be used to interpret that the balance 50.78% stake i.e. majority stake in DHPL is held by promoters of Dynemic Products Ltd and they control the management and all the decision making of DHPL. An investor would notice that DHPL was formed in FY2008 and the investor would further observe while analysing the shareholding pattern of Dynemic Products Ltd that from June 2008, the name of DHPL started appearing in the list of entities through which promoters’ held their stake in Dynemic Products Ltd.
(Please note that the above image has been edited to remove the names of entities from serial number 3-39 to reduce the non-relevant data. The complete shareholding pattern of promoters in Dynemic Products Ltd on June 30, 2008, can be accessed on BSE website here). assuming current (Sept 30, 2017) shareholding structure of promoters vs. public shareholders of about 40:60 in Dynemic Products Ltd, the share of contribution of Dynemic Products Ltd’s funds (49.22%) in DHPL can be bifurcated into promoters (19.69% = 49.22% * 40%) and public shareholders (29.53% = 49.22% * 60%). Therefore, an investor would appreciate that out of every rupee being invested by DHPL, 29.53% is indirectly being contributed by the public/retail shareholders of Dynemic Products Ltd by virtue of their 60% shareholding in the Dynemic Products Ltd. Whereas due to the majority stake of DHPL being controlled by promoters, its management control is with the promoters and the shares of Dynemic Products Ltd owned by DHPL are being shown under full control of promoters as seen in the shareholding details disclosures shown above. An investor would appreciate that by virtue of the shareholding structure of DHPL being 50.78% promoters and 49.22% Dynemic Products Ltd, the promoters are effectively able to use the 29.53% funds contribution by public/retail shareholders to increase their ownership stake in Dynemic Products Ltd by way of acquiring shares in the name of DHPL. this effectively means that the public/retail shareholders are funding the promoters to increase their equity stake in Dynemic Products Ltd.
and as the investment by Dynemic Products Ltd (and therefore in turn by retail/public shareholders) in DHPL is in the form of equity shares, therefore, effectively these funds are perpetually available to promoters at zero cost i.e. no interest to be paid and probably never to be repaid as well. While looking at the corporate information of DHPL in the corporate database Zaubacorp (click here), an investor would notice that the DHPL has been using the same email ID as that of Dynemic Products Ltd. 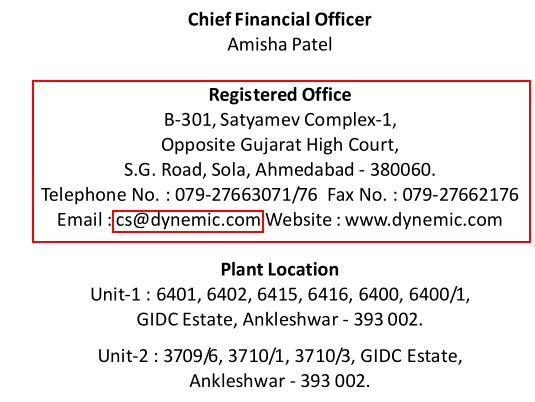 Looking at the above information, an investor would appreciate that Dynemic Products Ltd (and in turn public/retail shareholders who are 60% holders of the company) are also contributing the operational infrastructure to DHPL for functioning. Moreover, looking at the related party transactions section in the FY2017 annual report, page 82, an investor would notice that Dynemic Products Ltd (and in turn public/retail shareholders) are spending money on behalf of the DHPL (associate company). Therefore, an investor would appreciate that the case of DHPL might be construed as a situation where public/retail shareholders of Dynemic Products Ltd are providing funds, infrastructure to function and are spending on behalf of DHPL to enable it to hold promoters’ stake in Dynemic Products Ltd. The shareholding of DHPL in Dynemic Products Ltd has been changing over the years esp. since March 2014. The same might look like trading activity where the shares, which were sold during FY2015 are bought back in FY2016 & FY2017. 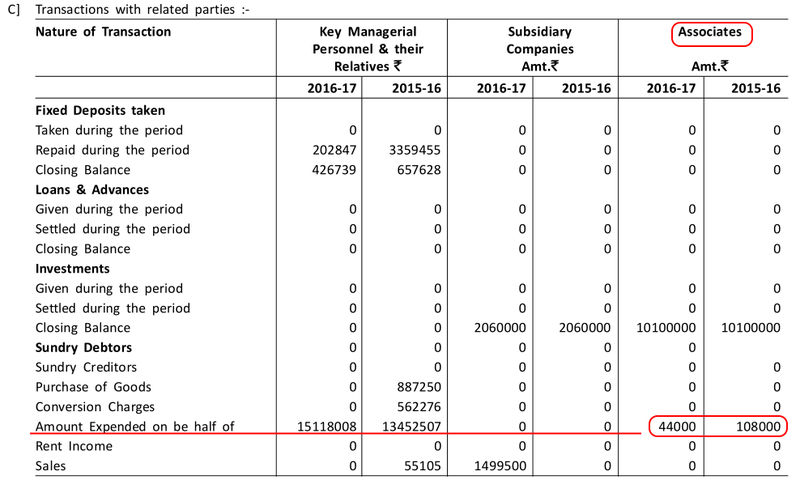 In the section of the related party transactions from FY2017 annual report of Dynemic Products Ltd, page 82, which has been shared above, an investor would notice that the company has spent about ₹1.5 cr. in FY2017 and ₹1.34 cr. in FY2016 on behalf of promoters. Moreover, in the above section, the investor would also notice that the company has taken fixed deposits from the promoters. An investor may analyse them in further details to assess whether the interest being paid by the company on these fixed deposits to promoters is in line with the market rate (i.e. FD return being offered by other banks/NBFCs etc.). 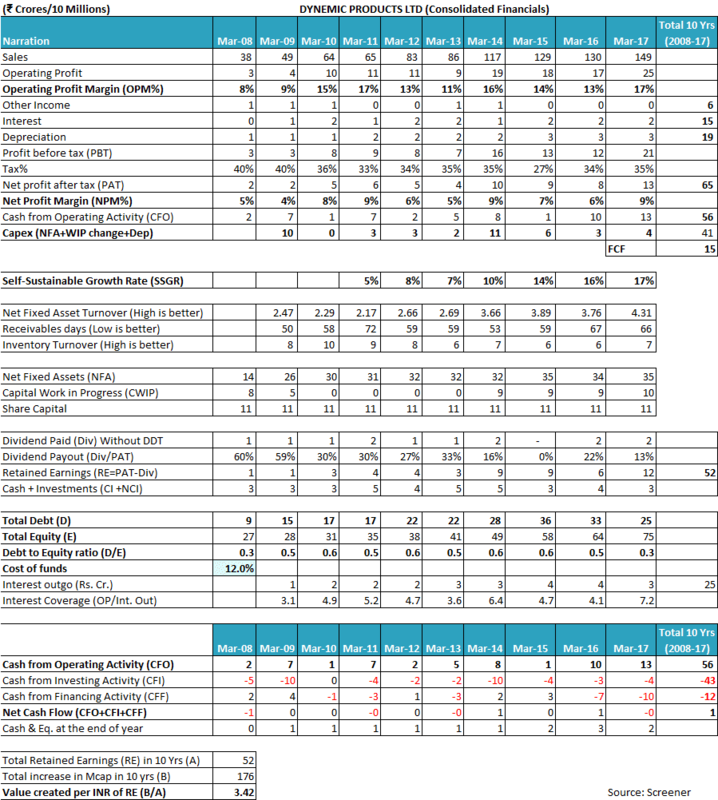 Analysis of the annual reports of Dynemic Products Ltd would indicate to an investor that the company has invested in HDFC PMS (Real Estate Portfolio) and IndiaReit Fund Scheme IV, which invest in real estate. The company exited its investment in HDFC PMS in FY2016 whereas the investment in IndiaReit is still continuing. The company seems to have had the peak investment level of about ₹59 lac in HDFC PMS (Real Estate Portfolio) in FY2011. (Annual report FY2011, page 50). An investor would appreciate that investment in avenues like real estate funds is non-core to the business of the company. The fact that the company witnessed its debt levels increase from ₹9 cr. in FY2008 to ₹25 cr. 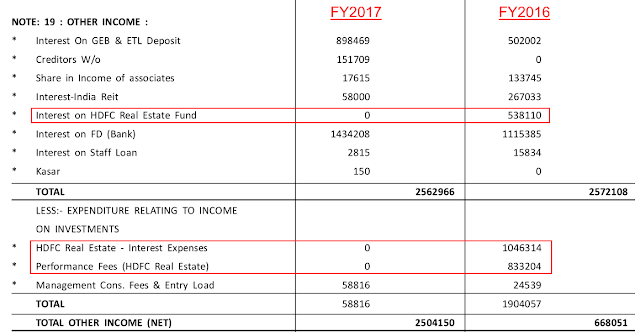 in FY2017, indicates that the company could have used the funds, which it invested in real estate funds to reduce debt. Real estate fund investments are specialised investment vehicles carrying higher risks, which might not be compatible with the risk profile of the shareholders of the company, which might lead to unexpected unfavourable outcomes. An investor would notice that in FY2016, the company earned ₹5.38 lac from HDFC PMS (Real Estate Portfolio) as income whereas it had to bear costs of ₹18.79 lac (10.46 + 8.33) as expenses for the scheme.It seems that in FY2016, the company had to bear losses on its investment in this fund. An investor may analyse the performance in previous years over the entire life of the company’s investment in the fund to assess whether the company made any gains out of its investment in HDFC PMS (Real Estate Portfolio). While analysing the annual report, an investor would notice that the company has been classifying some trade receivables as non-current assets, which are ideally expected to be received after more than 12 months from the date of the balance sheet. It is advised that investors may seek clarification from the company about the nature of these receivables, which has led the company to classify them under non-current assets instead of current assets. 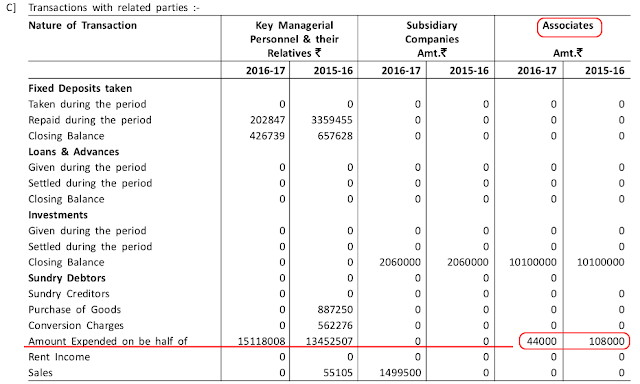 While assessing the section “Details Pertaining to Employees as Required under Section 197(12) of the Companies Act 2013” in the FY2017 annual report, page 12, an investor would notice that the median remuneration of the employees of the company in FY2017 was ₹0.23 lac. An investor would appreciate that an annual remuneration of ₹0.23 lac (less than ₹2,000 per month), is very low to make ends meet in any city including Ankleshwar, where the company has both its existing manufacturing units. Moreover, ₹0.23 lac per annum being the salary of the employee representing the median indicates that about half of the total 170 employees on the rolls of the company earn a remuneration even less than ₹0.23 lac per annum (further less than ₹2,000 per month). Investors may seek clarifications from the company whether the data reported about the median remuneration is the correct data or there has been any inadvertent error while preparing the report like the remuneration of 0.23 lac being monthly rather than annual remuneration. (We have taken the reported data as annual in the absence of specific mention of ₹0.23 lac being monthly remuneration because all the data in the annual report is usually reported in annual formats e.g. the remuneration levels of promoters/directors etc.). Seeking clarification in this regard is important is because if the data is correct and about half of the workforce of the company is earning less than ₹2,000 per month, then there is a high probability of the employees being dissatisfied from the remuneration levels and the company might witness high attrition or even employee unrest in future. Currently (Nov 3, 2017), Dynemic Products Ltd is available at a price to earnings (P/E) ratio of about 15 based on trailing 12 months earnings, which barely offers any margin of safety in the purchase price as described by Benjamin Graham in his book The Intelligent Investor. Overall, Dynemic Products Ltd seems to be a company, which has been growing at a moderate pace in a competitive business environment leading to lack of pricing power resulting in fluctuating profitability margins over the years. The company has witnessed its profits getting stuck in working capital as the inventory, as well as receivables management, leaves scope for improvement. However, the low capital intensiveness of the business as characterized by relatively high NFAT has led to the company keeping its debt levels under check despite doing capex for meeting the sales growth requirements. The company has disclosed expansion plans for the third manufacturing unit in Dahej to meet the future growth requirements. However, the company is yet to receive necessary govt. approvals despite getting the allotment of land in FY2014. The company seems to have put in place a management succession plan. However, there are concerns about the shareholding of promoters declining significantly over last decade. Certain transactions by the company like investing in equity in a promoter owned entity which seems to have used the funds to buy shares of the company itself need to be analysed deeper by the investors. Certain other transactions done by the company like investment in real estate funds do not seem to have added a lot of value to the shareholders. Investors may seek clarification from the company about aspects like remuneration levels of employees, treatment of trade receivables as non-current assets etc. Going ahead, it is advised that investors should keep a close watch on the profitability levels, working capital management including inventory and receivables, developments related to Dahej plant, shareholding level of promoters and transactions like expenses being incurred by the company for related parties. These are our views about Dynemic Products Ltd. However, investors should do their own analysis before taking any investment related decision about the company.